"I am very pleased that Dr. Lujan has accepted the presidency of Lamar Community College," McCallin said. "Her background in community college leadership and strong advocacy of community colleges based on her own background make me confident that she will be a strong, effective leader for the college. We are looking forward to working with her and welcome her back to the system and to the college." "I am excited about joining such a strong college and system. The students, community members, faculty and staff of LCC are rightfully proud of their college and its commitment to student and community success. I look forward to continuing LCC's long legacy of service, engagement, and excellence," Lujan remarked. Dr. Lujan was selected as the result of a nationwide search. Community members, students and staff had the opportunity to meet her during a public forum and reception in Lamar on April 27-28. As the New Ventures Officer for the Maricopa Community College District, Dr. Lujan's executive role is focused on leading the development of scalable, revenue-generating partnerships and initiatives for the system. 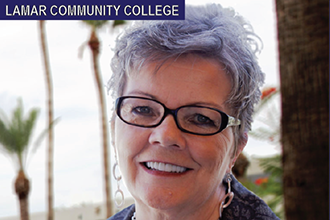 Previously, she served six years as President and Chief Executive Officer of Chandler-Gilbert Community College. Before that she was the Vice President for Academic Affairs at South Mountain Community College in Arizona. Lujan began her community college career with the Colorado Community College System, serving as a faculty department chair in Computer Science and Information Systems and then as assistant division director of the Business and Professional Services Division at Arapahoe Community College. She then served as dean of the Centers for Business and Technology and Health Sciences at the Community College of Denver. However, her ties to CCCS go even deeper, beginning with her own academic career at Arapahoe Community College in Littleton, CO, as a first-generation, re-entry student where she earned an Associate of Applied Science in Management Information Systems. She went on to earn a Bachelor of Arts in Human Resource Management from Colorado Christian University, a Masters of Arts in Educational Technology from The George Washington University, and a Ph.D. with an emphasis in Community College Leadership from Colorado State University. Dr. Lujan is a peer reviewer for the Higher Learning Commission's Open Pathway and AQIP accreditation processes. In her community college roles, Lujan has served on numerous community boards including chambers of commerce and economic development boards.